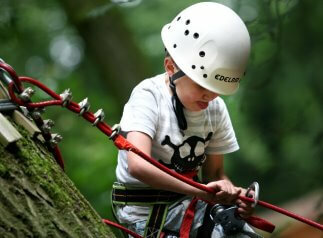 Have some real adventure at Almere’s exciting climbing forest, the Fun Forest! This forest has the perfect climbing course for people of all ages. And this extensive forest area has the most and concurrently, also the longest ropeways of The Netherlands. The climbing courses differ a lot in their height and grade of difficulty. So challenge yourself and go a bit further each time! Fun Forest is the perfect outdoor excursion for your entire family, for a kids party or for an exciting trip with the school class, full of fun. Read on to learn more about the various options and courses. Book your great excursion via the website! 1,5 h climbing for kids from 8 to 11 years and a minimum body height of 1.30m. Perfect for kids who want to climb independently. 3 h climbing for kids from 8 to 11 years and a minimum body height of 1.30m. Please note: Kids between 8 and 11 years who want to do the regular climbing course must be accompanied by adults – every two kids at least by one adult (18+). 3 h climbing for youngsters from 12 to 17 years and a minimum body height of 1.30m. They may climb this course independently! 3 h climbing for adults, 18 years or older. They may climb as far as they wish!